"Expecting a crowd? Treat 'em to the Southwest flavor of New Mexico Green Chile Dip. A hearty dip of lean ground beef, refried beans, chilies and cheese comes together with McCormick® Cheesy Taco Seasoning Mix. Get dipping with tortilla chips as you cheer on your favorite team." Preheat oven to 350 degrees F. Brown meat in large skillet on medium-high heat. Drain fat. Stir in Seasoning Mix and milk. Bring to boil. Reduce heat to low; simmer 2 minutes or until slightly thickened, stirring occasionally. Spread cream cheese in shallow baking dish. 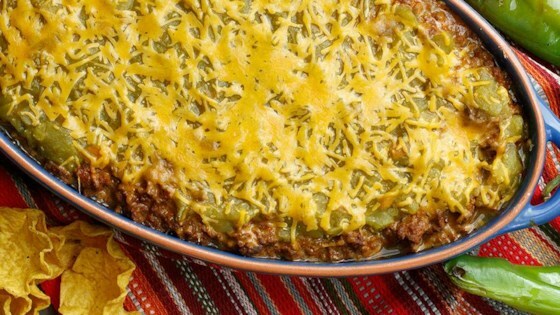 Layer with refried beans, meat mixture, green chiles and cheese. Bake 10 to 15 minutes or until heated through. Serve with tortilla chips.